Hi everyone! Welcome to the Mama Elephant May Stampede! You've already seen the first looks at the April release on the Mama Elephant blog, and the new release is now live and available for purchase in the store here! For the stampede, I'm using the new set Sunny Skies! It's raining enamel dots! (I wish!) This card was so much fun to make. I hope that the colorful rainbow clouds will brighten the recipients day! And for you all out there hoarding your enamel dots, here's your chance to go wild(***whispering***....you know you want to do it!) By the way, the awesome speech bubble is from the set Bling. To celebrate the new release, Mama Elephant is giving away 3 gift certificates worth $20 each to 3 lucky people! Winners will be chosen at random from the collective blogs in the Stampede. Winners will be announced on the blog May 19th. Thank you so much for stopping by!! Come back tomorrow for the start of the DT stamp highlights! Your rainbow clouds are for sure cheerful, love them!! Yay, you're the first one to use Sunny Skies--my fav new set! I love the sentiment in the speech bubble. Cute! LOVE LOVE LOVE!!! All those enamel dots!!!! Wheeeee! i am consistantly floored by your cards!! i love them all!! and this one is no different! i LOVE this card!! the rainbow clouds and enamel dots are amazing!!! i will be smiling all day from this card!! Totally trend-setting and ADORABLE! Love love loving this card!! Enamel dots and clouds are a perfect combination! And I Like Mama Elephant on Facebook. This is a very cute card. I love the concept . Using enamel dots for rain that matches the cloud colors is so creative. I'm going to follow your blog. All I can say is Cute, cute cute!!!!! Loving the rainbow clouds and the rainbow rain... kind of reminds me of Skittles commercials! TFS! This card makes me smile!!! LOVE those colorful clouds and raindrops!!! So super sweet!! JJ this is so cool, love the rainbow of clouds and the colourful raindrops! You have some fantastic colors in your cloud rainbow. I love it. How fun is this card! Love the rainbow goodness. LOVE your fun card! Just adore those enamel dots! WOW!!! Love how you used the enamel dots!!! Very pretty! Don't you just love enamel dots? Rainbow clouds and dots?!! I looooove this! I follow ME on FB. I shared MEs post on FB. I follow ME's blog now. Sentiment and clouds work together nicely. Good job! love all those dots, and what a great cloud! Simply delightful! Love the rainbow clouds and enamel dots along with the sentiment. Thank you for the continuous inspiration! Reminds me of raining skittles :) I like it! Oh my, this card made me so happy. You nailed it. love how you coordinated up your colors! I need some of those cute enamel dots!! So fun! Love the rainbow colors and those enamel dots!! Wonderful card. I love the rainbow of colors. Well done. Ha! Colorful and cool! It reminds me of Skittles, too! So much fun, JJ! This card is adorable, JJ! I liked ME on facebook, too. I love this cute rainbow card! Love your card, the enamel dots are so cool!!!! Genius! I never would have thought to make a rainbow of clouds! And what a great use of enamel dots - love this!! i really love your rainbow theme!!! TFS! Love the rainbow look...the enamel dots make such cute rain. Very cute and colorful card. Could you send those clouds across the ocean. I don't have any enamel dots. Yet. Love your design. So what's new? OH MY GOD THAT IS AWESOME!!! LOOK at all those dots! and of course duh, I love the rainbow :) So cool!! Adorable card so going to try something similar!!! Liked ME on Facebook but I am not on Twitter! I am a ME blog follower. Lovely card - I love the summery colours and clouds. Loving the rainbow clouds! It's like hitting the mother load of enamel dots here! So fun! Great colors! I'm going to have to get some enameled dots! Wow, creative card....just makes you happy! eekkk!!! Love the dots to match the happy clouds! So fun! This card makes me happy to look at it...it has such a rainbow of colour! I have become a follower of the Mama Elephant blog. 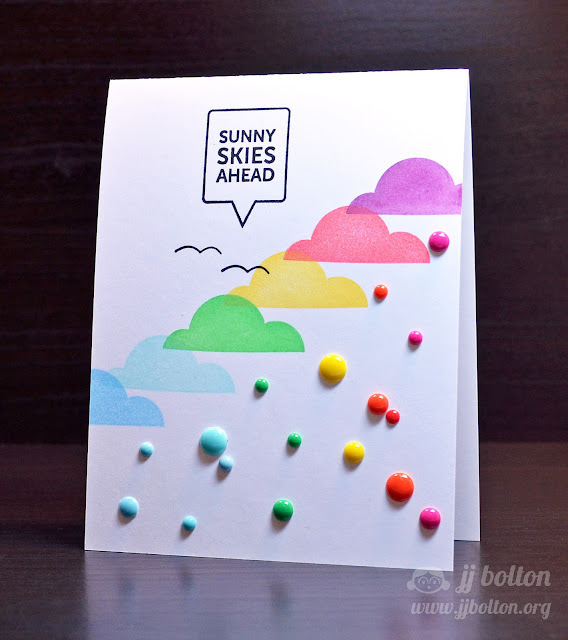 Love your card...the clouds and enamel dots are so cool! Love your rainbow of clouds! Really fun! I think this set is my favorite. I loved how you used the enamel dots. So pretty--love all the colors. What a cheerful card...love this! I am also a follower of the ME blog. Love Love Love the enamel dots . . . and the clouds too. thanks. You always come up with such great cards, thanks for sharing them. wow wee this is so cool.. great design.. So nice and colorful and fun. Love the rainbow clouds. Love love the rainbow effect. Love the rainbow clouds and drops. Great idea. oh my!!! rainbow clouds and skittle rain! I love it!!!! So CUTE!!! LOVE all the enamel dots!!! Beautiful day-brightening, smile-making rainbow card! Delightful! I love, love, love what you did with the enamel dots - so fun! Perfection! Liking the enamel dot rain drops! Amazing card. Never thought one could make a rainbow out of colourful clouds. I love the colors! I never thought to use multiple colors for clouds. Going to have to try that now. Your card is so fun and colorful and creative! So inspiring! Absolutely adore the rainbow colored clouds. The card looks so fun! Fun card! Love the colors and the enamel dots! Love the card, thanks for sharing. JJ, I love how you stamped the cards in rainbow colors. So fun and cute. Oh WOW! Absolutely love everything about this card. The colours and accents are prefect. FANTASTIC!!!!! All the color, the shiny dots, and of course the sentiment just make me happy - a true JJ card!! Love these colorful clouds and raindrops. Sooooooo pretty! !